Keeping your face clean and clear is a lot easier said than done. Why you ask? Acne is affected by everything you do! That’s right. Acne is primarily caused by heredity factors and hormones but simple behaviors such as the amount of sleep you receive, or your daily exercise routine can play a major role in preventing or developing unwanted acne. 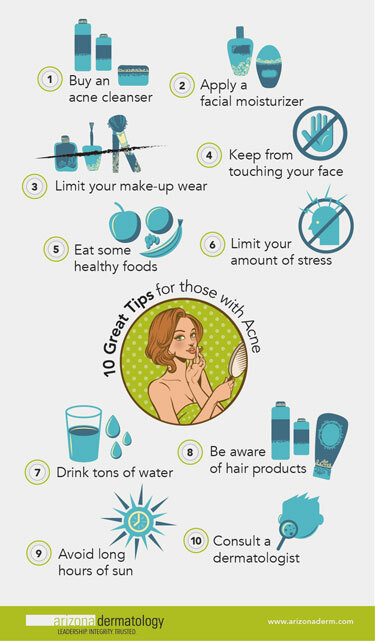 With these 10 tips for those suffering from acne, treating your existing acne and preventing further breakouts may be easier than you think. Acne can affect a person’s social and emotional life. Although the severity of acne differs from person to person, nobody enjoys the inflammation and redness acne conveys to the skin. Acne (medically known as Acne Vulgaris) is basically the swelling that occurs when a gland produces an excessive amount of sebum (a natural oil our body produces to control the dryness of the skin), which forms a plug combined with dead skin cells. The plug eventually blocks the skin’s hair follicle and begins to form a small hard spot on the skin known as a pimple. Everyone may see acne as the same bothersome red bumps that adversely affect the skin, but the truth is there are different types of pimples, some of which can be a much more serious problem than others. Whiteheads—very small pimples and remain under the surface of the skin. Blackheads—the visible black pimples seen on the surface of the skin. Cysts—the painful pimples caused by bacteria and can be seen from the surface of the skin. Papules—small pink pimples seen from the surface of the skin. Pustules—red pimples with a white top and are seen on the surface of the skin. Nodules—large painful pimples implanted deep within the skin, but can also be seen on the surface of the skin. Now that you understand the basics of acne, it’s time to dig a little deeper into the methods you can use to help treat your acne and stop it from reoccurring. This is the simple step to basic skin care. The most effective facial cleansers are the ones that are made for your skin type. If your makeup tends to rub off easily or you have enlarged pores, you may suffer from oily skin that needs to be washed with an oil-free or salicylic acid cleanser. If your skin cracks easily, peels, or leaves behind red patches, you may suffer from dry skin. Dry skin is best taken care of with cleansers that aren’t filled with harsh ingredients and are non-fragrant. No matter what your skin type is, don’t overly wash your face hoping to scrub your pimples away. The rule of thumb is to wash your face twice a day, once for dry skin types, and always after sweating excessively. Using a facial cleanser for your skin type is only half the battle. No matter what you discover about your skin type, everyone should keep their face nourished with a non-comedogenic moisturizer after each wash. Non-comedogenic moisturizers do not contain oils or waxes that can clog pores and contribute to acne. Common brands include: Neutrogena, Aveeno, Clinique or moisturizers sold at a dermatology office. A moisturizer protects your skin by forming a barrier to retain the water you already have in your face. Despite what you may think, a moisturizer does not add moisture to your face, but simply works so you don’t lose the water that’s already apparent in your skin. Waking up with a face full of acne is everyone’s worst nightmare. Although most use makeup to hide the small imperfections they find about their face, ironically doing so can increase the development of acne. It is important to read the labels on your makeup to find products that won’t damage your skin. Although the best solution is to eliminate using makeup completely, the idea of never applying another concealer is nearly impossible. That is why we recommended applying your makeup sparingly. Take a few days off out of the week and strut a clean and makeup-free face for the day. If your job or lifestyle doesn’t allow it, find acne-friendly makeup whose labels say they are oil free, non-comedogenic, or sulfate-free. Also, remember to never sleep with your make up on! If you find yourself too tired to take off your makeup nightly, invest in quick and easy makeup remover wipes. Stop and think about everything your hands have touched today. Exactly! Your hands are breeding grounds for bacteria which can easily be transmitted to your face. Touching your face can be anything from placing your palm on your chin when watching TV to picking your face while trying to remove a pesky pimple. Not only does touching your face increase the appearance of acne, but doing so can also leave horrible acne scarring. Acne, if left untouched, is rarely found to leave behind scarring on its own. Here are a few ways you can cut back and quit this hard to break habit. Keep your hands busy—do a cross word puzzle, word search, or give yourself a manicure during your down time. Wash your hands—this helps cut back on transferring bacteria to your face. Tell your friends and family—inform others to give you a friendly reminder every time they see you touching your face to help cut back on the habit. It’s true! You are what you eat. If you don’t take into consideration the fatty foods you eat every day, the quick appearance of acne will be a great reminder. Food has been connected to the formation of acne. Sugars and starchy processed foods you find at your nearest grocery store can increase your blood sugar which triggers your body to produce insulin (a hormone that allows your body to use sugar for energy). Increased production of the insulin hormone can cause overactive oil gland activity and the growth of pore clogging cells, ultimately triggering a serious case of acne. Watch out for overindulging in sweet and starchy foods and integrate more vegetables and low-sugar fruits into your diet. Plus, it never hurt to cut sugars and starches from your diet to help trim down the waist line. The state of emotional strain that everyone tries to avoid. That’s right, stress. We all endure it and we all have our own ways of coping with it. Unfortunately, stress is one action that can be hard to avoid and also promotes the development of acne. Although it may not trigger the development of new acne, it has been proven to worsen your current matters. When you are feeling stressed or upset, your body can aggravate your skin and increase the inflammation of your blemishes for a more noticeable appearance. In addition to inflammation, high levels of stress can cause a person to endure further habits known to increase acne. Take a look below at a few bad and good ways to handle your stress and control your breakouts. Drinking water is a simple yet very effective way to eliminate the appearance of acne. Consuming water helps clear out toxins in your body and maintain healthy hydrated skin. Did you know when your body is telling you you’re thirsty, it means you are already dehydrated? So don’t wait to feel thirsty to start drinking water. Staying hydrated will replenish what was lost throughout the day, which in the end helps to reduce the formation of acne. This is a must for oily skin types! I’m sure it’s safe to say that before reading this tip, the last thing you were paying attention to while in the shower is how your hair routine can affect your acne. Well the truth is, your shampoo may be promoting your acne, especially around the forehead! Your scalp naturally produces oil to keep it well hydrated, so the additional oil from your shampoo used to maintain healthy hair can increase acne breakouts. In addition to your shampoo, excessive use of hair products such as mousse, gels, and hairspray can also clog your pores when coming in contact with the skin. Be aware when rinsing your hair to keep the soap suds away from your face, and be careful to not overuse hair products when styling. Don’t be fooled when it comes to sun exposure and how it supposedly helps to reduce the appearance of acne. Exposure to the sun’s rays can actually dry out your skin which weakens the barrier you have to retain moisture. Your body naturally overproduces oil to help prevent your skin from drying out and can often form blackheads later on in time. So while the thought of a nice tan and clear skin seems pleasant, the sun exposure is not a smart solution to eliminate your breakouts. You can enjoy the benefits of the sun without damaging your skin’s barrier by using the appropriate amount and type of sunscreen, which also helps to reduce the risk of skin cancer. You have tried all the tips and tricks in the book to eliminate your acne and nothing seems to be working quite as well as you want. We recommend consulting a dermatologist to help find a final solution! Chances are you may need a stronger cleaning solution, laser light treatment, chemical peels or microdermabrasion to get the noticeable results you want. If you are on the border on whether or not you should consult a dermatologist, take a look at a few common questions you may want to ask yourself to ensure your final decision is a good one. Is you acne affecting your self-esteem? Have none of the grocery store facial cleansers been working? Is the pain of your acne intolerable? Do you have dark acne scarring that is worsening? If you answered “yes” to any of these questions, then you want to speak with a dermatologist to find a more effective solution for your acne. 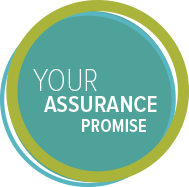 There are several acne treatment options available to improve the appearance of mild to severe acne. Ease your mind and take control over your lifestyle by not letting the effects of acne hold you back!